Writing is a subject that is "hit or miss" around my house. The boys are either loving it and working hard or they are hating it and it takes hours to write a descriptive sentence about a malfunctioning robot. Lately we've been working on that robot, if you know what I mean. I am always looking for the best approach to not only develop their skills, but also spark their interest in writing. 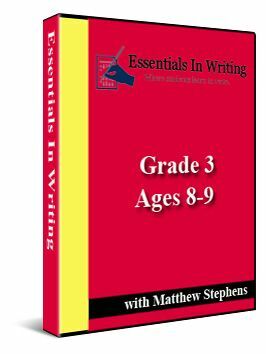 Essentials in Writing (EIW) is the program that has done just that. EIW is a complete language arts program, but it is different from your traditional program. Your student will not spend time diagramming sentences. Although that is an important skill, it is not a focus in the EIW program. The emphasis in EIW is on composition. Younger students (grades 1 to 6) learn how to use part of speech to communicate better with their reader. Older students (grades 7 and 8) will learn and practice grammar skills during drafting and revising their work. Not only are the students in every level learning the important rules of grammar and writing, but they are immediately using these rules to improve their own work. The program has several parts. Students watch a video lesson from Mr. Stephens in which concepts will be presented and reviewed and work will be assigned. Assignments will be small and intended to practice, apply, and retain material. Students complete their assignments in the student workbook. New writing is modeled by Mr. Stephens to ensure that students understand how the new concepts can be used. The program is designed for grades 1 to 12, with grade 12 becoming available this summer. 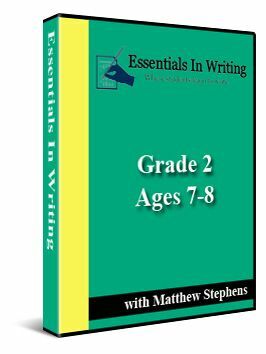 I received Essentials in Writing Grade 5 to use with James. The program came with the DVDs and a PDF file to print up the workbook. There is also an option to purchase a printed workbook from the company. Although I didn't choose to do this, I recommend it because it was more money for me to print up the workbook than the company charges if you purchase one from them. 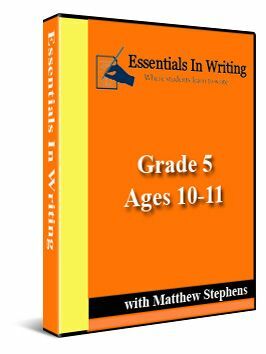 Grade 5 covers sentence structure, grammar and rules and various types of writing including friendly letter, narrative, descriptive, and expository. Click here to view a sample lesson from the level. James is used to completing 30 minutes of writing instruction daily, and so it was easy to transition to Essentials in Writing. As stated above, the program is divided into two sections: Grammar and Composition. For the first week James just worked on the grammar section, completing two to four lessons daily. I would have him take notes on the video and he would complete the workbook exercises at the end of lesson. After the first week we added composition lessons, resulting in about 30 minutes of writing each day. This quickly proved to be too much, though, as the writing section got intense fairly quickly. We settled on alternating days between writing and grammar lessons. Sometimes a single writing lesson would take two days to complete. That was fine with me because I would rather James really knew the material instead of hurrying through just to complete a certain number of lessons. The lessons were short, and the exercises in the workbook reinforced the material on the video. I did not have to direct his learning for this subject; it was all done for me on the video. James would occasionally have questions, and if I was unsure of the answer it was easy to consult the answer key in the back of the workbook. Knowing that James was getting quality instruction was a relief and allowed me some extra time to help the other three kids with their schooling. I think this program is excellent. So excellent, in fact, that I ordered second and third grade levels for Henry and Isaac and have been using those for the last several weeks. I purchased the pre-printed workbook from the company, saving me both time and money. I am very pleased with how much all three boys have accomplished in this short amount of time. I am sure that this writing program is going to be a permanent part of our curriculum from now on. The only thing that was difficult for me about the program was that the answer key to the workbook is located in the back of the workbook and it was kind of annoying to have to flip back and forth to correct the daily assignments. The key is written very small to conserve space and this was also difficult for me. I think I am going to print up the answer keys separately to make it easier for me to review their work. Sometimes the writing required was a bit more than I usually expect of the boys. That may sound funny considering this is a writing program. I found that some of the exercises in the workbook section for grammar were more like "busy work" and so instead of taking the complete subject and rewriting it on the line with a complete predicate, I would allow them to only write a complete predicate. Instead of copying two dozen different noun words into separate categories, I would allow the boys to draw lines showing the category the noun should go. Instead of copying an entire sentence with the mistakes corrected, I allowed them to just circle the mistakes and write the corrections above them. The boys still completed the exercises, but I modified the activities to suit their needs. I like this program. I think that Mr. Stephens is funny, but he doesn't waste the whole class time making jokes. I feel like I learn something every lesson, except when it is like a review lesson. I like the program. I like that it is not really long but you still learn a lot from it. I like it because some parts are funny. Essentials in Writing courses come with DVD lessons and workbook exercises in PDF format for $40. Pre-printed workbooks for each level are also available for $20. In addition to the standard writing and grammar programs, EIW is set to release High School Writing Elective courses sometime in the future. Check the website or Facebook page for updates. Many other folks over at The Schoolhouse Review Crew used different programs from Essentials in Writing. To read their reviews click the banner below or CLICK HERE.